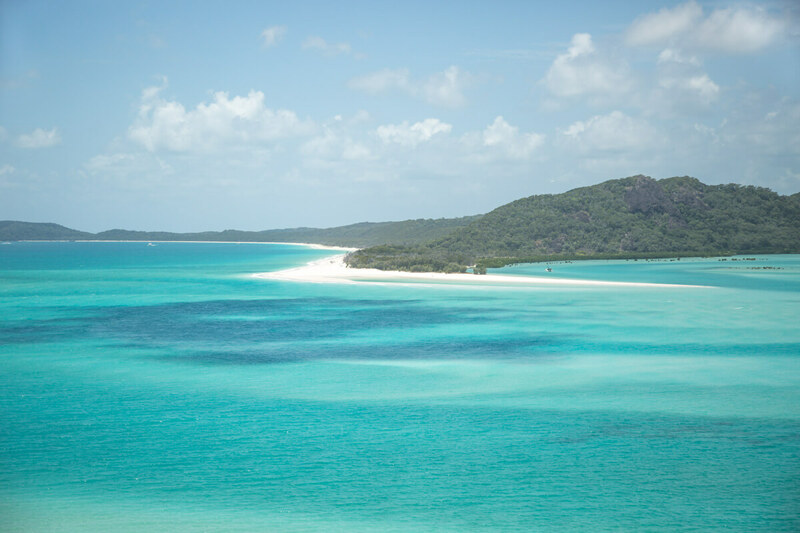 A Guide to the Whitsundays – Which Boat Should you Book? 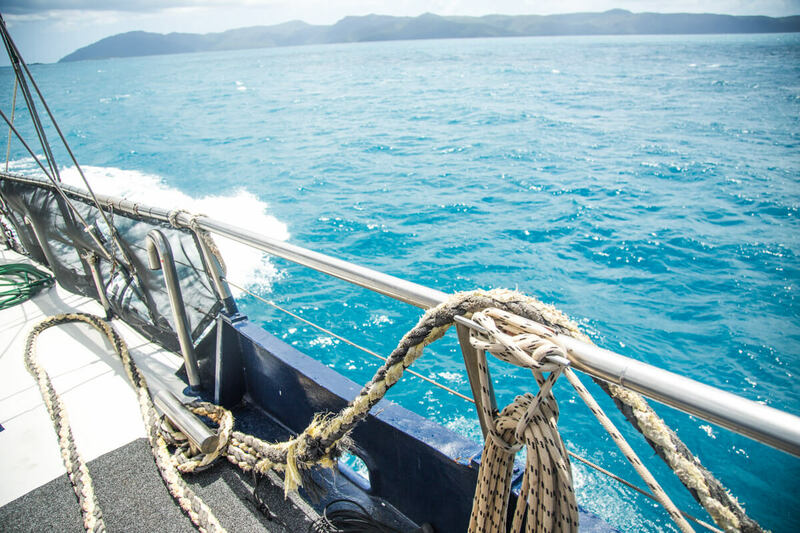 Home » A Guide to the Whitsundays – Which Boat Should you Book? The swirl is iconic. Just you wait until you see it in the flesh. There’s no photoshop needed whatsoever when it comes to Whitehaven Beach. 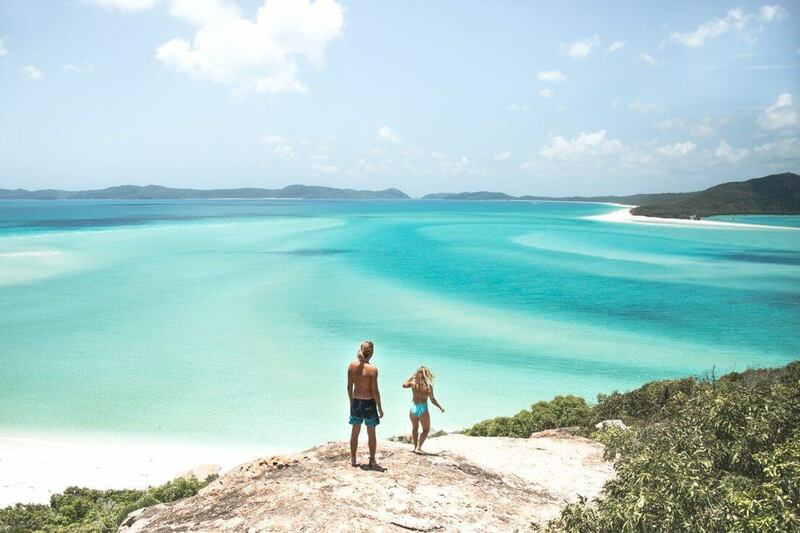 Whitehaven Beach has every reason to be sat at the top of your bucket list for your adventure in Australia. The Whitsundays are a group of 74 islands located just off the Queensland coast and are home to unbelievable white sandy beaches, crystal clear waters, coral reefs teeming with wildlife and plenty of rainforest hikes and trails. It’s a tropical paradise for travellers and backpackers alike. 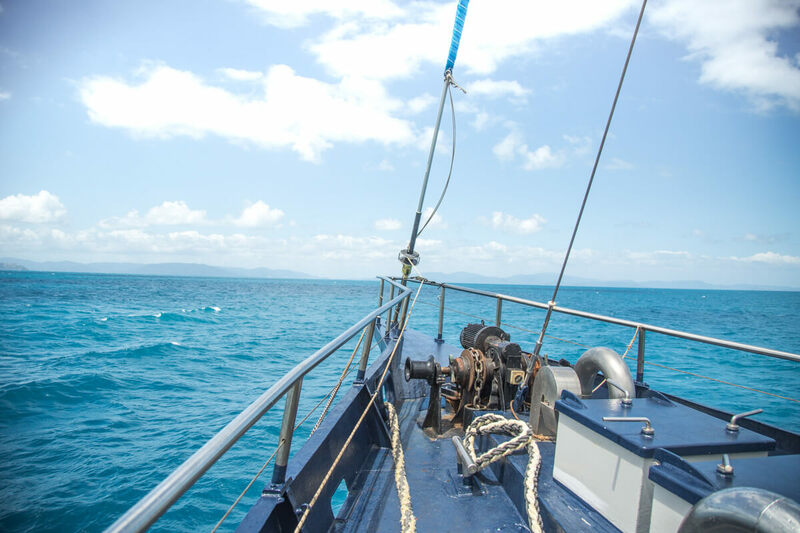 Heading out to explore on a sailing tour is an amazing way to see this phenomenon and will give you access to beaches and reef that are only accessible by boat. Whitehaven Beach is included in all sailing trips so don’t worry, there’s no chance you’re going home without that picture. Lets just say your insta feed will be making people at home VERY jealous. Top tip: As this is a popular destination the better quality more affordable trips get booked out in advance so it’s a good idea to lock in your dates as soon as you know which trip you’d like. Firstly, there are super small chilled Backpacker boats with around 18 people on board. Secondly, there are the larger tall ship party boats which have around 55 people on board. Although you will party at night they still hit the EPIC spots in the day. There are also day trips available if you’re time down under is limited but you can’t bear the thought of missing out this once in a lifetime location. We KNOW that at some point in your trip you are going to need to chill and relax and this epic option for the Whitsundays is all about just that! This trip caters for those that we like to call ‘Flashpackers’ that like the finer things in life but on a backpackers budget. 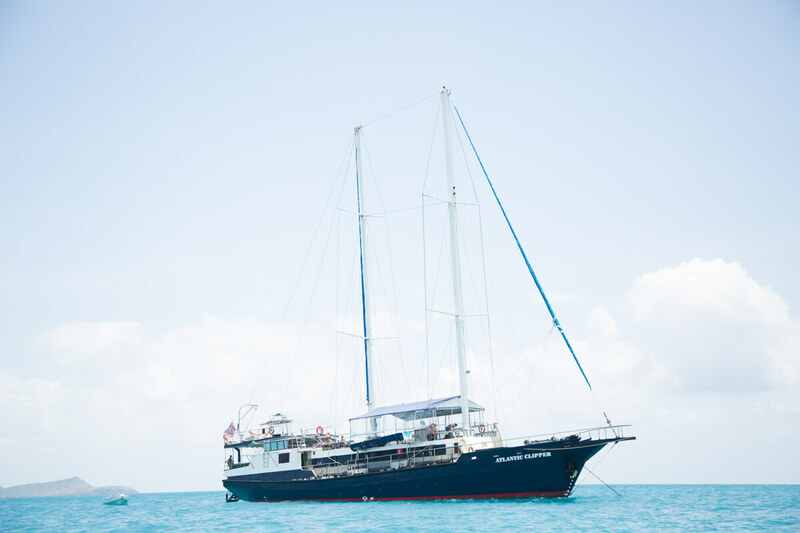 Powerplay is an insane catamaran that can fit 18 people, has a jacuzzi on board, the best food and even a photographer to capture epic moments of your Whitsundays sailing trip! We love the Powerplay as it’s the perfect option for the relaxed traveller, couples, the young at heart and those looking for a social but laid back atmosphere. You’ll feel a world away from normal life during the trip as you’ll be chilling in style in the heated jacuzzi, having delicious food & BBQ cooked for you, having drinks under the stars and visiting some incredible locations such as Whitehaven Beach! Whilst on this trip you’ll be able to snorkel the Great Barrier Reef, paddleboard and swim in the crystal clear water. Want to book this trip? Use the MOLLIE10 promo code when booking with RatPack Travel for 10% off your booking! Book your powerplay adventure here. When backpacking the east coast you’ll have plenty of opportunities to party (trust us, we’ve experienced the hangovers) and where better to party than on a boat with 55 other backpackers cruising the Whitsundays? The Atlantic Clipper is an absolute legendary boat and if you are up for a lot of banter, day long bevvys, hilarious crew, and making unreal memories, this tour is perfect for you! We guarantee that you will have an epic time on this boat, it’s the party boat of the Whitsundays and the perfect option if you like to party! We’re talking a 12 person hot tub, a fancy dress show by the crew onboard and the opportunity to win the King or Queen of the Clipper! Although you will party at night they still hit the EPIC spots in the day AKA Whitehaven beach and epic snorkel spots – If you are into this option.. expect to party hard with a large group! See my blog post from sailing the Whitsundays on board the Atlantic clipper here. Want to book this trip? Use the MOLLIE10 promo code when booking with RatPack Travel for 10% off your booking! Book your Atlantic Clipper adventure here. If you’re looking for something that’s a perfect combo between chilled and party and a combination of the two boats above, then we recommend the super social boat, the New Horizon! 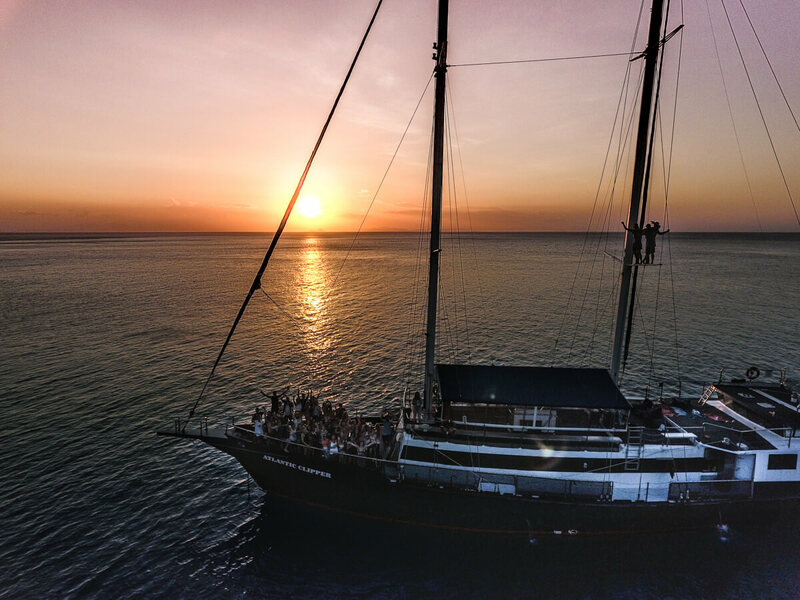 This boat is an awesome tall sailing boat with the perfect balance of party and chilled out vibes all whilst taking in the incredible views of the Whitsundays. This is the most affordable and popular option out of the Whitsundays boats with around 30 people on board! You’ll have an awesome few days sailing through the Whitsunday islands full of so many activities including a waterslide, snorkelling, paddle boards and a diving board to show off your skills and give Tom Daley a run for his money! 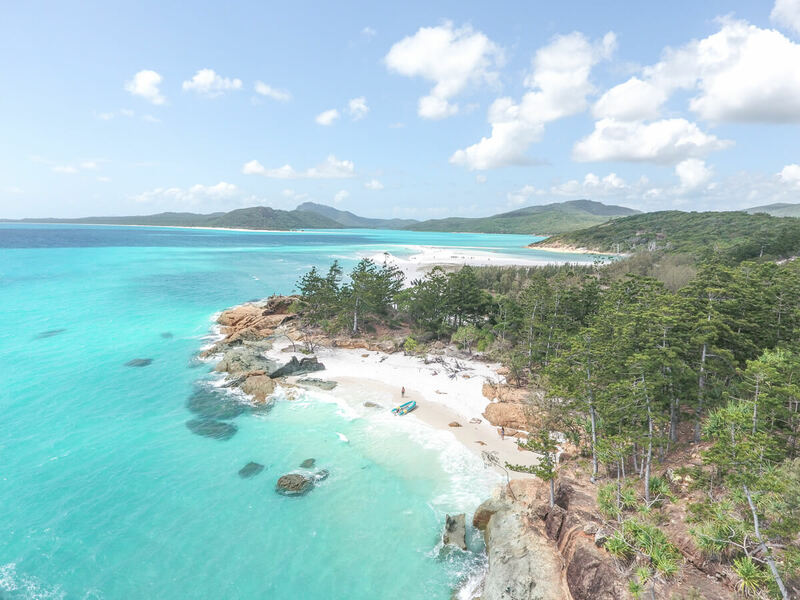 You’ll see all of the top sites and of course a key highlight of the trip is going to the most instagrammable beach in the world- Whitehaven Beach. This boat is perfect if you like to enjoy a couple of drinks under the stars at night and relaxing in the daytime with a group of social and fun backpackers. You’ll be looked after by the epic crew who will cook for you, provide entertainment and tell you all about the beautiful Whitsundays! Want to book this trip? Use the MOLLIE10 promo code when booking with RatPack Travel for 10% off your booking! Book your New Horizon adventure here. If you know what trip you’d like, but you are not sure of the date you’d like just yet, drop my friend Sammy a message at www.ratpacktravel.com and he will make you a personalised calendar based on your dates. Seen a different Whitsunday trip you like the look of? There are other options that RatPack sell (and that you can use MOLLIE10 on for 10% discount), including day trips, so if you’ve seen something you prefer drop Sammy at RatPack travel a message and he will sort you out. These were just my recommendations. Ratpack are the only agent that offers 100% full refund on any cancelled trips due to weather. RatPack knows that travelling sometimes isn’t perfect so if a big old storm rolls in and cancels your trip, you can expect all your money back. Have you been to the Whitsundays? Which boat did you go on? I’d love to know! Remember, if you’re booking anything in Australia (tours, transport, day trips, campervans) use the MOLLIE10 promo code to save 10% when booking with RatPack Travel. The only place i’d recommend booking.